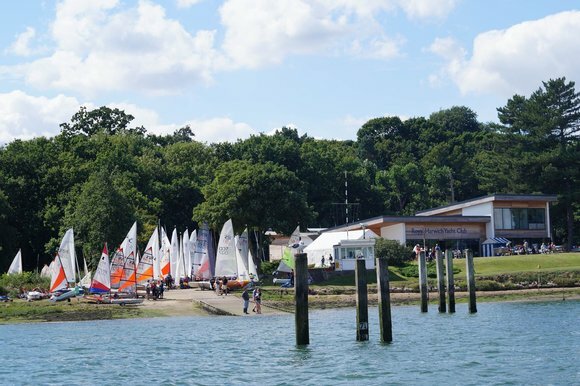 RHYC has an excellent Clubhouse set in a beautiful, peaceful location on the banks of the River Orwell. The Clubhouse provides excellent sailing and social facilities, including bar and catering to serve the needs of members and visiting sailors, clubs and cruising associations, who are always welcome. The Clubhouse has a spacious lawn running down to the riverbank, with excellent views across the tidal River Orwell - a great place to sit and relax with a drink or a meal. The whole Clubhouse, or any of the three separate rooms, can be booked for private and corporate functions. We have our own marina in front of the Clubhouse providing berths for members and short-term pontoon spaces for visitors. Members can also hire club swinging moorings in the river. There are scrubbing posts where cruisers can dry out and an all-tide slipway for dinghy launching. Dinghy sailors are well catered for, with an extensive dinghy park and modern, spacious changing rooms. Further details on the Clubhouse facilities are provided here, with details of the sailing facilities (including information on how to book a berth in the marina) provided here.